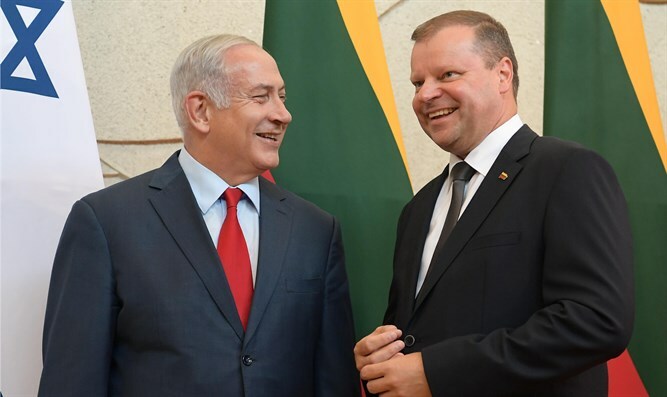 Netanyahu meets Lithuanian Prime Minister Saulius Skvernelis, thanks him for taking a stand of "clarity, truth and courage" at the EU. Prime Minister Binyamin Netanyahu met on Thursday evening with Lithuanian Prime Minister Saulius Skvernelis at his office in Vilnius. Also attending the meeting were Lithuanian Foreign Minister Linas Linkevicius, Interior Minister Eimutis Misiunas and the two entourages. Skvernelis also hosted an official dinner for Netanyahu. “Lithuania and Israel are as you said natural allies. We share the values of freedom and democracy. We are two nation states proud of our national identity and committed to protecting individual rights,” he continued. “Lithuania stresses in its constitution that sovereignty belongs to the Lithuanian people while maintaining an unflagging democracy for all. You take great pride in your customs, in your language, your unique heritage and your historic capital. I have to tell you Prime Minister all that sounds very familiar to us. Israel is the nation state of the Jewish people. We too are proud of our history, our long history, our robust and pluralistic democracy which guarantees the rights of all our citizens. We are proud of our language, an ancient language, Hebrew revived after thousands of years, our traditions and our historic capital Jerusalem to which I invite you and your colleagues,” Netanyahu told Skvernelis. “I believe that seizing these technologies enables small countries to have an impact of big countries. And we are each seizing our future in our own special ways but we can seize it better together,” Netanyahu told his Lithuanian counterpart. “Last year our two countries celebrated 25 years of diplomatic relations. And cooperation obviously increases each year, particularly since we opened our embassy here in Vilnius in 2015,” he said. “I appreciate the important, realistic, independent and sober stand of Lithuania on these and other matters,” he said. “Vilnius was known as the 'Jerusalem of Lita,' 'Jerusalem of Lithuania,' but as you know there was also a dark chapter. The Jews of Lithuania were almost entirely wiped out in the Holocaust by the Nazis and their collaborators,” he continued.